Warren Holland, who prayed intensely as his US Air flight landed safely in the Hudson River. Kimberly McLagan, who put herself in God’s hands after seven years of infertility and then had four children. Kathleen Kardon, whose children were miraculously rescued from her submerged car by a mysterious man who immediately disappeared. Herchel Newman, the firefighter trapped in a deathly blaze who prayed to Jesus and was told how to escape. Heidi Krumenauer, whose mother’s in operable terminal cancer disappeared after she prayed and recited Psalm 23 over and over. This book brought out strong emotions within me as I read. I found the stories were so powerful that I could only read a few at a time before I felt overcome with emotion. These emotions ranged from awe, sadness, grief to even anger…I will explain that in a bit. The stories were all religious with people who have strong faith in God and most of the miracles were divine interventions. I found myself touched so deeply especially the stories where kids were involved and rescued from harm’s way. I do believe in angels and am always fascinated where angels are intervening and helping a person in need and then suddenly are gone again. In fact, I know people in real life that this has happened to after a bad car accident. They swear that there was an angel that came down to help them. I believe it too. 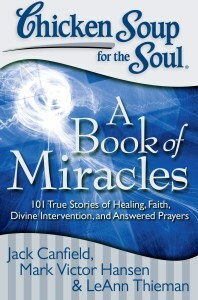 The stories that had me sad and even angry were the ones about people healing miraculously from illnesses. I have suffered in pain for the last 5 years and have prayed my heart out. Not a day goes by that I don’t ask for help from above. I am glad that these people were healed, but it made me feel really depressed that I am not special enough to be cured of this relentless pain as well. Maybe it’s selfish of me to want to be “normal” again. I forget what life is like without pain. It was just really hard for me to read these stories because of my own situation. However, it does renew hope within me that I might be lucky enough to have my own miracle if I keep praying hard enough…or maybe not. Who knows right? Overall, this was a book that moved me and one that I will probably ending reading again just as a reminder that people do overcome insurmountable odds. I have always liked the Chicken Soup books…but I find that now days I have a hard time finding them in the stores. I love the Chicken Soup books and this one sounds really good. The Chicken Soup books are an enjoyable read! I love all the Chicken Soup for the soul books! Please enter me in the giveaway.Thank you. I Subscribe to your blog by email.augustlily06(at)aim(dot)com. Voted for you on PFB today. This would be a great Christmas gift for most anyone. I have never read any of the Chicken Soup books but I am dying to. It sounds like a very inspiring book.